Quality is when the customer comes back, not the product. Customers need to be convinced of purchasing a product over and over again and - apart from the price - it is primarily product quality that motivates consumers to repurchase it. This underlines the sheer economic necessity of a well-functioning quality management system. CAQ AG’s modular quality management software solutions provide the perfect toolset with which to put a quality mindset into practice and improve, document, and uphold the quality of products. The food industry serves as a prime example for showcasing the need for consistent quality, as consumers need to be convinced of purchasing a product over and over again. Consumers look for products that provide good value for money, are high-grade, and safe: nowhere else does the quality of a product serve as such a crystal clear decision criterion as in the foodstuffs business. It therefore comes as no surprise that our everyday food is also probably one of the most strictly controlled products in circulation. The British Retail Consortium, GMP, FDA, ISO 22000, and the International Food Standard (IFS) are only a few of the international rules and regulations that apply in the foodstuffs industry. 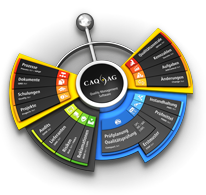 Even though all of the aforementioned standards and regulations would serve the purpose of explaining the high requirements imposed on the food industry and the advantages of digitalized quality management solutions such as CAQ AG’s CAQ.Net® software, the International Food Standard probably highlights said aspects most clearly. IFS Food is a standard for the auditing of companies that process food or companies that pack loose food products. IFS Food is only applied where the product is "processed or handled", or if there is a danger of product contamination during the primary packaging. The companies that support the IFS and require said certification from their suppliers include METRO (D), Carrefour (F), EDEKA (D), REWE (D), ALDI (D), LIDL (D), Kaufland (D), Group Casino (F), Coop (IT), COOP (CH), CONAD (IT), Dachser (D), Kraftverkehr Nagel (D), US Foods (US), Dawn Foods (US), Concho Y Toro (Chile), Mercadona (SP), DIA (SP), Billa (AT), Superuinie (NL), and VION Food (NL). Currently virtually all food producers that supply retailers and wholesalers with products are included in the scope of IFS. IFS Food, IFS Logistics and IFS PACsecure are standards recognized by the GFSI (Global Food Safety Initiative). Ahold, Wal Mart, Migros (CH) and Delhaize on the retailing side and Coca-Cola, Nestlé, Danone and Cargill on the manufacturing side are just a few of the companies that support GFSI and recognize certificates from GFSI recognized standards. The IFS requires that a vast variety of quality measures are put into place, managed, and documented. Maintaining these measures, however, is difficult with pen and paper or MS Excel solutions alone. This is where the various CAQ.Net® solutions come into play, as they offer a whole host of functions in order to improve, document, and uphold the quality of products and thus directly assist IFS-compliance. The following areas provide a small overview of the correlations between IFS and the individual CAQ.Net® modules and highlight the advantages achieved by switching from a paper-based system to a fully digitalized CAQ.Net® solution. IFS chapter 3 "Resource Management" (3.1 Human Resources Management, 3.3 Training and instruction) for instance requires that all personnel performing work that affects product safety, legality and quality shall have the required competence by education, work experience and / or training, commensurate with their role, based on hazard analysis and assessment of associated risks. The company shall implement documented training and / or instruction programs with respect to the product requirements and the training needs of the employees based on their job. The Qualify.Net training management module supports you during the planning, execution, and documentation of all training-related matters. Apart from assisting during the documentation of all existing qualifications and planning of future employee trainings, it is primarily the consistent target/actual comparison regarding required and available qualifications that provides a significant reduction of the training-related workload. Just a few clicks allow you to fulfil key documentation duties and create an expressive and easily maintainable qualification and training database. The qualification matrix in the software furthermore allows you to, for instance, precisely trace which employee requires training in which area and at what point in time said training is due. This means you can consistently monitor and document any type of training and qualification – regardless of whether you are dealing with safety / hygiene trainings, language tuitions, technical schoolings, or any other type of training. Chapter 4.4 "Purchasing" requires that companies shall control their purchasing processes to ensure that all externally sourced materials and services, which have an impact on food safety and quality, conform to requirements. There shall furthermore be a procedure for approval and monitoring of suppliers (internal and external), outsourced production or part of it. Said approval and monitoring procedure shall contain clear assessment criteria such as: audits, certificates of analysis, supplier reliability and complaints, as well as required performance standards. The seamless interconnection of the various CAQ.Net® modules facilitates comprehensive supplier management. In order to execute an expressive supplier management it is necessary that you have direct access to all available data and can evaluate said data simultaneously. The clear advantages of the SRM.Net supplier management module lie in the fact that all data you gather that is relevant to the relationship between your company and your supplier – such as supplier self-evaluations, audits, complaints, CAPAs, risk-analyses or incoming goods inspections – can be analysed in one go and be used to achieve crystal clear supplier evaluations. The audit management module QAM.Net allows you to conduct paperless, onsite, and web-based audits. Simply send questionnaires to your suppliers via the Internet, and these can reply directly in an online portal – allowing you to acquire, evaluate, and manage all your customer/supplier audits via the web. In the final steps of your auditing process, QAM.Net allows you to design detailed and expressive reports, evaluations, and graphics, which serve as the basis for efficient and effective job and cost management. Amongst other aspects, IFS chapter 2 "Quality and Food Safety Management System" requires that the system for food safety and quality management shall be documented and implemented and a documented procedure shall exist for the control of documents and their amendments. Successfully fulfilling these requirements without running a streamlined document management system is simply unthinkable today, as the traceability, approval, and monitoring of documents are increasingly important factors – especially when dealing with audits or certifications. In the past, documents were generally distributed, archived, and confirmed in paper form. Nowadays, we have "live" electronic documents that offer unprecedented opportunities regarding revision management, electronic confirmation, and change tracking. The software QBD.Net allows you to create, maintain, control, and archive the vast variety of document types that are required for running an enterprise and ensuring comprehensive traceability. Amongst a host of other functions, QBD.Net includes sophisticated escalation management, project tracking, document access control, and facilitates a 100 % paper-free and 21 CFR Part 11-compliant documentation. Chapter 5.8 "Management of Complaints from Authorities and Customers” requires that a system shall be in place for the management of product complaints and that complaints shall be analysed with a view to implementing preventive actions which avoid the recurrence of the non-conformity. In addition, chapter 5.9 "Management of Incidents, Product Withdrawal, and Product Recall" states that a documented procedure shall be defined for management of incidents and of potential emergency situations that impact food safety, legality and quality. This is where the service and risk management modules come into play. The software REM.Net provides support throughout your every-day complaint-workflow. For this purpose, 8D reports, Ishikawa diagrams, the 5-Why method, and many other functions are available during and after the processing of complaints in your company. REM.Net accompanies you all the way from the receipt of a complaint via its initial processing to customer-response, analysis, cost-control, and escalation management. It allows you to easily establish whether the root cause of a problem lies in the raw materials delivered by your supplier, poorly trained personnel, or a faulty step in the production process. The CAPA functions in the software allow you to create and apply extensive corrective and preventive actions at all times. These actions enable an effective and systematic treatment of quality defects, errors, and disruptions in accordance with the concept of prophylactic and preventative failure and error management. The risk management software Risk.Net provides you with everything you require for conducting any type of risk analysis. Its clearly defined HACCP-system, Ishikawa diagrams, and expressive risk matrices allow you to easily identify and evaluate relevant risks and thus fulfil key requirements of customers and regulating authorities. The list of correlations between IFS and the individual CAQ.Net® modules goes on and on. IFS chapter 5.4 "Calibration, Adjustment and Checking of Measuring and Monitoring Devices" is managed via the gauge management module, chapter 5.6 "Product Analysis" and 4.14 "Receipt of Goods and Storage" via the quality inspection / LIMS module, and chapter 2.2.1 "HACCP-System" as well as the omnipresent hazard analyses are managed via the risk management module. There are also suitable CAQ.Net® solutions available for managing chapter 4.16 "Maintenance and Repair" or 1.2 "Corporate Structure" in shape of the maintenance management and process management modules respectively. Companies in the foodstuffs industry today must grasp the advantages provided by digitalisation and software in order to keep up with the quality expectations of their customers, stay ahead of their competition, and adhere to ever-increasing quality assurance regulations such as BRC, GMP, ISO 22000 and the International Food Standard (IFS) discussed above. The quality management software solutions by CAQ AG were developed with precisely these goals in mind and support companies around the globe to increase, monitor, and document the quality and safety of their products and thereby assist them on their journey toward quality excellence.